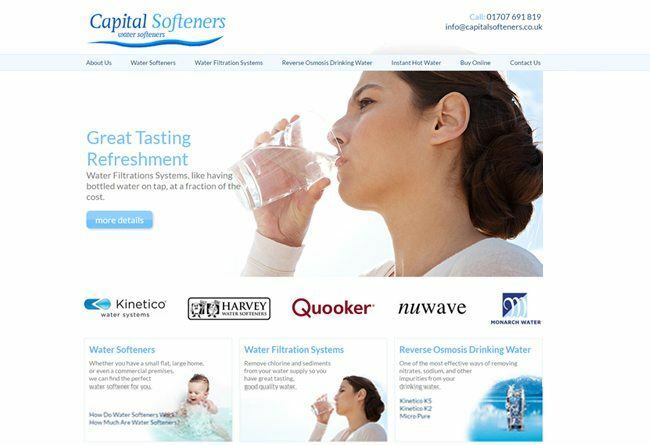 Capital Softeners had their first website designed by Innermedia years ago – the site had worked well for years, but it was out of date, unresponsive, and needed a total overhaul to meet current design standards and to rank again. As part of the update, they also wanted to add an e-commerce section to the site so that visitors could buy salt for their water softeners or even whole units to install themselves. Making the e-commerce section a small section of the site rather than the underlying structure means that there are more pages to rank and the site can provide more information for customers who are shopping around or just researching the subject. While design is important, content is what convinces and converts visitors – that’s why Capital Softeners also asked our team to write the copy for the site. The new website is optimised for local SEO as well as product types to ensure that they have the best chance of ranking in the local area. We created the structure around their product offering and geographical areas to improve their rankings for people further down the sales funnel, as well as pages to clearly explain the benefits of their products. The new design lets people get to the content that they want quickly and easily, while showcasing the brands that Capital Softeners work with. As an independent seller, the range of brands is one of their biggest USPs and it had to make an impact as soon as you hit the homepage. They’re extremely pleased with the site, and we’re looking forward to seeing the impact on their conversions. “We’d just like to say we are very happy with our website and found everyone at Innermedia very helpful, from the planning stages right through to completion.